Willi Korth was born in Stargard / Pommern on 11 July 1913. He learned machining and toolmaking at the Deutsche Reichsbahn between 1930 and 1934. Ten years later, in the summer of 1944, he briefly worked at Mauser-Werke under contract as an independent designer of military small arms. In August of 1950 Korth moved to Ratzeburg. Next year he found a job as a manager at the Hubertus Metallwerke in Mölln. In 1952 Korth resigned to pursue his own designs. His first effort was a blank firing gas revolver. The few gas revolvers, designed and manufactured by Korth in the winter of 1954/55, are now sought after as collector’s items. On 1 October 1955, following the expiration of the postwar ban on German manufacture of firearms, Korth founded a company in Ratzeburg under the name of Willi Korth, Waffenfabrikation. In September of 1955 Korth exercised his first manufacturing license for firearms. In 1962 he designed and manufactured his first revolver, initially chambered in .32 S&W Long, the highest caliber allowed by the terms of his license. Instead of a traditional cylinder release on the left hand side of the frame, the cylinders of these revolvers were unlatched from the frame by pulling forward the head of the ejector rod. The crane lock was released by the leftward push of a button located on the right hand side of the frame under the cylinder, whereupon the entire crane assembly complete with the cylinder would slide forward for removal from the frame. The first series production of Korth revolvers began in 1964 with the police revolver chambered in .38 Special, serial numbered 20xxx. In 1965, Korth introduced 4″ and 6″ barreled six-shot revolvers in .22LR and .22 Magnum, and five-shot models in .357 Magnum, serial numbered in the 21xxx series. The subsequent 22xxx/23xxx series appeared in 1967, comprising a small run of 6″ revolvers in .357 Magnum and .38 Special, as well as .22LR, plus a few 4″ .357 Magnums. Its new feature was a torsion trigger spring mounted on a stud accessible on the left-hand side of the frame, and fixed with a set screw on its right hand side. This arrangement allowed an easy adjustment of the trigger pull weight between 1kg (35.274 ozs) and 2.5kg (88.185 ozs) without disassembling the revolver. The 24xxx series, introduced in 1969, featured another innovation in the trigger action, patented in Germany as DE 1904675 A1, designed for a precise and tunable stacking transition in double action, achieved through the use of variously sized rollers on the trigger impinging upon the double action sear on the hammer. Thenceforth every revolver was shipped with five numbered metal wheels of different diameters that ranged from No.1 (0.283″) for the hardest stacking transition to No.5 (0.293″), for no stacking at all. Korth also added the second cylinder lock, achieved by latching the head of the axially fixed ejector rod inside a lug located under the barrel. Because the head of the ejector rod was no longer accessible for manipulation with the cylinder latched, Korth added a pivoting lever at the right side of the hammer to cause the cylinder release. The floating firing pin with its spring was retained in the frame by a transverse pin. Finally, the exposed coil mainspring gave way to the definitive sleeved telescopic design inspired by the MP38 recoil spring. The production of the second, Combat revolver variant started in 1973, with the first 15 specimens numbered in the 27xxx and continuing in the 28xxx series. They upped the centerfire cylinder capacity from five to six rounds and featured a rounded grip frame, a ramp front sight combined with a low mounted rear sight. Most significantly, they initiated the transition from the one-piece barrel topped with a ventilated rib and fitted with a short locking underlug, reminiscent of Dean W. King’s patented 1936 custom conversions of S&W revolvers, to a two-piece assembly comprising a tensioned barrel surrounded by a shroud topped with a ventilated rib and fitted with a full-length underlug, in an arrangement that referenced Colt’s 1955 Python externally, while replicating Karl R. Lewis’patented 1967 design originally realized by Dan Wesson. Throughout their production, Combat barrels varied in length between 77mm and 82mm, nominally designated as 3″. Meanwhile, the Sport revolvers retained their one-piece barrel fitting, with both five- and six-shot cylinders available through the 28xxx series. In the series 29xxx begun in 1974, Korth co-branded his revolvers with Dynamit Nobel serving as a distribution partner. All revolvers in this series were fitted with six-shot cylinders. The 30xxx series completed the transition to the two-piece barrel construction and introduced the optional 102mm or 4″ Combat barrel configuration. Finally, the 32xxx series introduced the definitive, semi-slabsided profile of the barrel shroud. All these features remained unchanged in the 1980 33xxx series, which for the first time added the 6″ Combat configuration. Meanwhile, beginning in 1978, Willi Korth had refocused his design work on a new autopistol, considering the action of his revolvers fully perfected. From the first five prototypes with features patented in Germany as DE 3111037 A1 and DE 3203991 A1, and produced in 1982, the manufacture of the first series did not start until 1989. The pistol never succeeded commercially, owing to lack of development and the initial price of $6,750.00. Willi Korth’s revolvers were benchmade by five gunsmiths at the rate averaging about 120 pieces a year. In contrast to the mass production standards, Korth revolver parts were neither cast nor milled. They were ground in the course of hard fitting from steel forgings that boasted a tensile strength of 1,700 psi. Each revolver required 70 man-hours that comprised 600 distinct operations. Their major components were surface hardened up to 60 HRC on the Rockwell hardness scale. The original production of Korth revolvers ended in 1981 with the serial number series 33xxx, adding up to a total of 7141 revolvers in calibers .38 Special, .357 Magnum, .22LR, and .22 Magnum, with barrel lengths ranging from 3″ to 6″, fitted with 6-shot rimfire and both 5- and 6-shot centerfire cylinders. The three main variants were the Combat, the Sport, and the Target models, some of which were finished as engraved luxury pieces. Korth turned over his business with all inventory, tools, and drawings to count Nikolas von Bernstorff on 30 June 1981. The company continued as Korth GmbH & Co. KG, its payroll peaking at 30 employees during the following decade. Its initial production comprised the 1982 transitional series 34xxx and 35xxx, still made under their inventor’s personal supervision. Following Korth’s resignation due to failing health in 1983, his successors produced the 36xxx, 37xxx, and 38xxx carbon steel series, mostly from the legacy parts fabricated and blanks forged by Willi Korth. They also introduced the Fxxx matte-finished Profi series priced 25% below its luxurious siblings and added the optional 5¼” barrel configuration and .32 S&W Long chambering. Additionally, in 1985 there appeared the short-lived Sxxx matte stainless steel series, highly sought after by collectors today. Starting with the 36xxx series in 1986, the top strap of the Korth frame was made about 0.5mm thicker, adding around 9 grams to its weight. Additionally, the crane was modified with a new cylinder bushing, which eliminated the gas check relief cut of the original centerfire revolver design. These modifications strengthened the revolver and improved its cylinder support, at the cost of accelerating the erosion of the forcing cone. Willi Korth died on 10 October 1992, leaving the development of his autopistol unfinished, with its production by his successors falling short of the inventor’s design goals in accuracy and reliability alike. In mid-1999 Korth GmbH underwent bankruptcy following a long production slump. Its assets were taken over in April 2000 by the Armurerie Freylinger of Luxembourg. Over the following years, five gunmakers employed by Freylinger produced the 39xxx and 40xxx series, briefly expanding into the American market by establishing a subsidiary in the United States in 2001 in a joint venture with Earl Sheehan, an independent importer of Walther firearms. In 2001, they introduced the finish option of plasma TiAlN PVD surface coating in satin and matte styles, which boasted exceptional abrasion resistance. 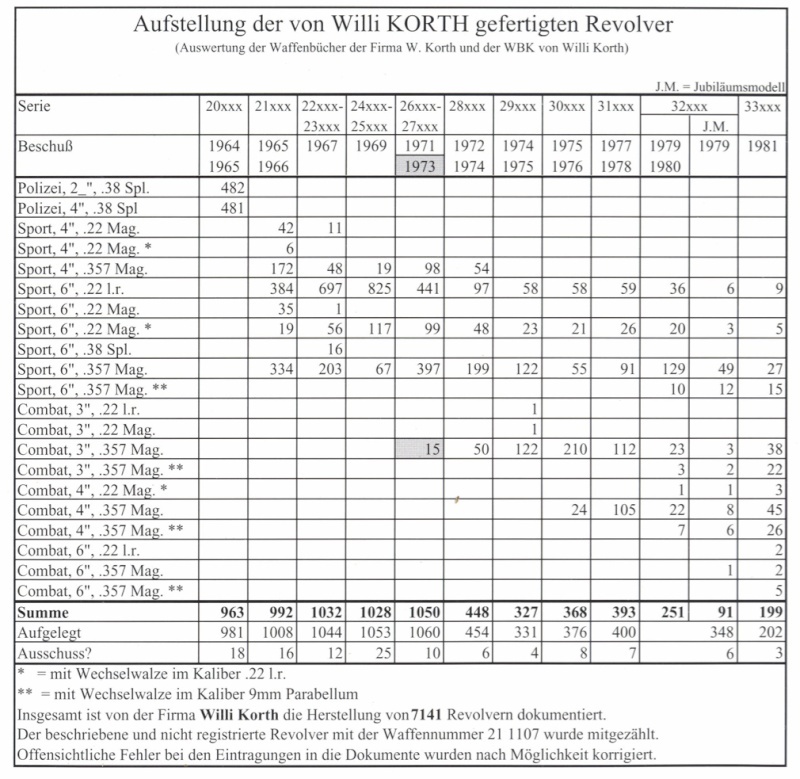 Since 2002, Korth revolver aficionados benefited from their comprehensive historical and technical analysis by Veit Morgenroth, arguably the most detailed investigation of a sporting firearm ever to be published. Regrettably, this treatise neglected the contributions of Korth’s successors, which included the Triple Lock, the externally tensioned mainspring, and switch-barrel configurations developed under the management of von Bernstorff. In November 2008 the original Korth factory in Ratzeburg clodsed its doors. But six months later, on 22 April 2009, Andreas Weber and Martin Rothmann revived the Korth trademark in Lollar near Giessen. The new owners of Korth exhibited their 41xxx revolver series and autopistol prototypes in 2012 and 2013, both at IWA in Nürnberg and the SHOT Show in Las Vegas. In the sequel, I shall examine some representative Combat and Sport revolvers manufactured by Willi Korth and his successors. Crossposted to larvatus and guns.